Now with FREE LOCAL DELIVERY! Action Printing was established in 1977. To keep up with the everchanging demands in the printing industry We have moved with the times by introducing the latest equipment and techniques available. Store front lettering, A-frame Signs, Interior Lettering, Vehicle Decals, Flags and Flag Poles and much more. Come by or call about great pricing. Words you will not hear from an Action Printing employee, in regards to placing ink or toner on paper. Often we are challenged by our friends in Ad Agencies and Corporate America with projects most print shops would deem impossible. Many times the task at hand appears not worth the expense to produce the job. Challenge” combined with our printing knowledge and the many years of experience we discover a logical, cost effective solution. 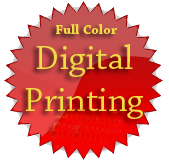 Action Printing provides full-color digital and offset printing services as well as binding, copying, in-house custom graphic design, pre-press, and direct mail marketing. Technology is a tool that allows us to extend the best possible service and reliability to you, our customer. We offer a complete digital workflow. A digital proof is created instantly when you order online. We know printing. Our sales staff understands the demands of business and will provide the best solution to meet your print buying needs. Copyright, Inc. All rights reserved.